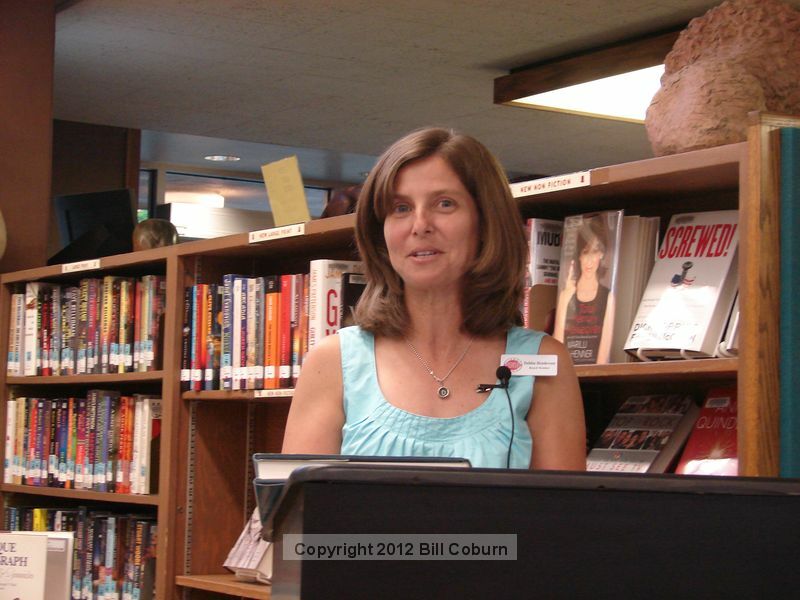 Posted 7/22/12 – New Sierra Madre Historical Preservation Society (SMHPS) president Amy Putnam kicked off the SMHPS annual meeting with lots of welcomes, thanks and acknowledgments Thursday night. 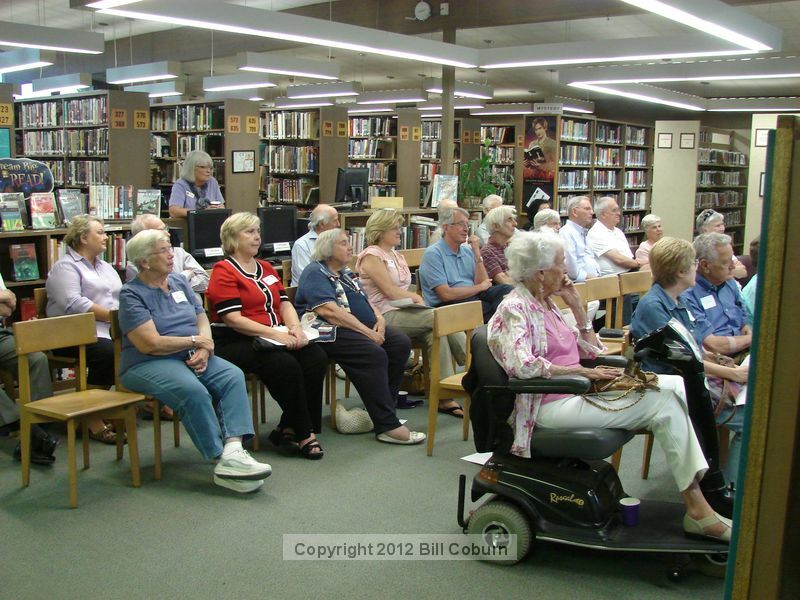 She welcomed all members in attendance and encouraged non-members to become members…She thanked Library archivist Debbie Henderson for helping arrange the venue. 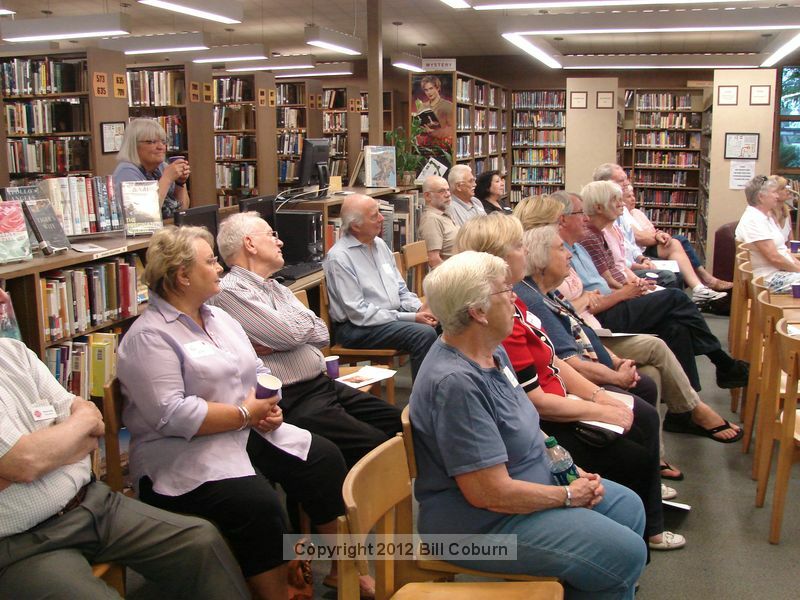 She acknowledged the owners of some of Sierra Madre’s landmark homes that were in attendance. 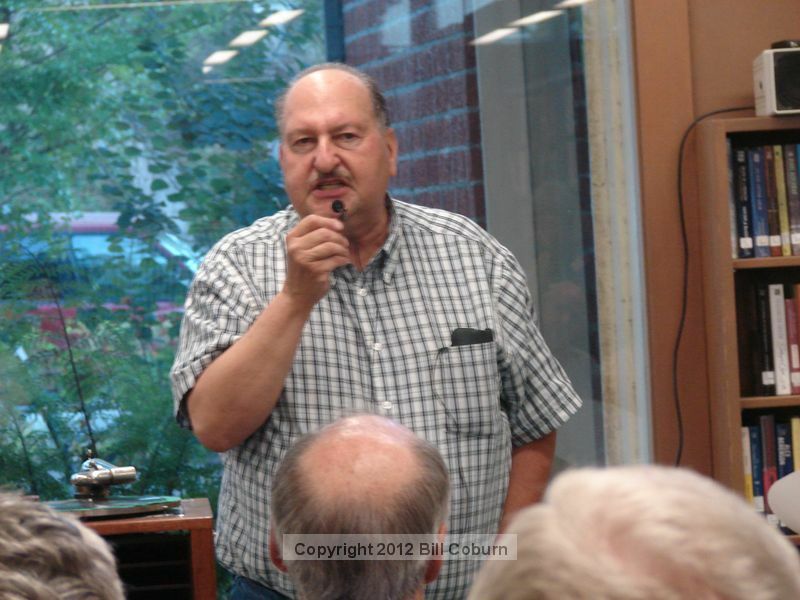 She introduced the Historical Society Board of Directors. 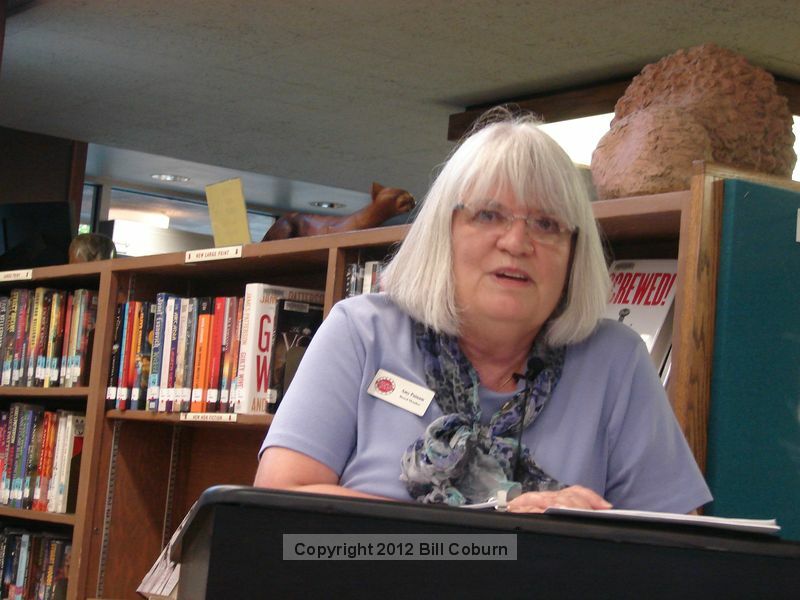 She introduced the two previous presidents, Dane Lenton and Gurdon Miller, neither of whom were in attendance. 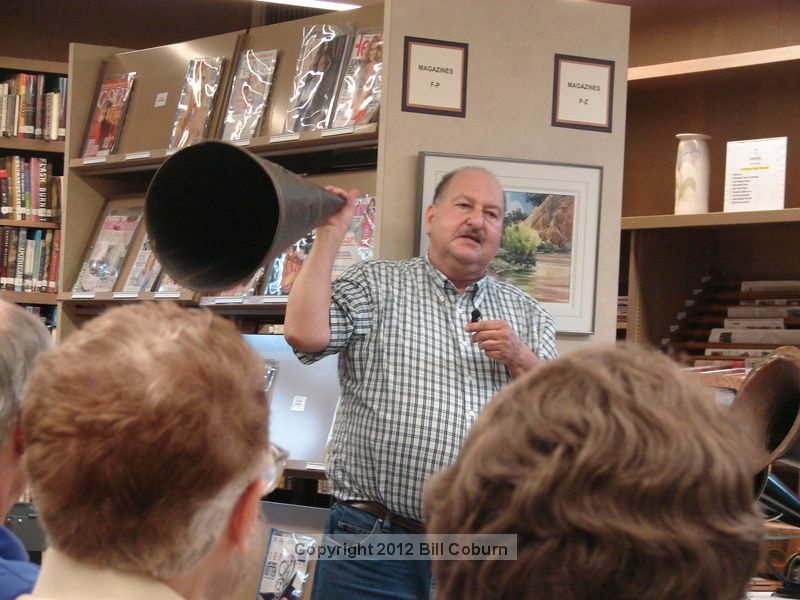 However, she read a letter from Miller, who is vacationing in Montana. In it, he reviewed some of the group’s accomplishments over the last year, and also thanked people. 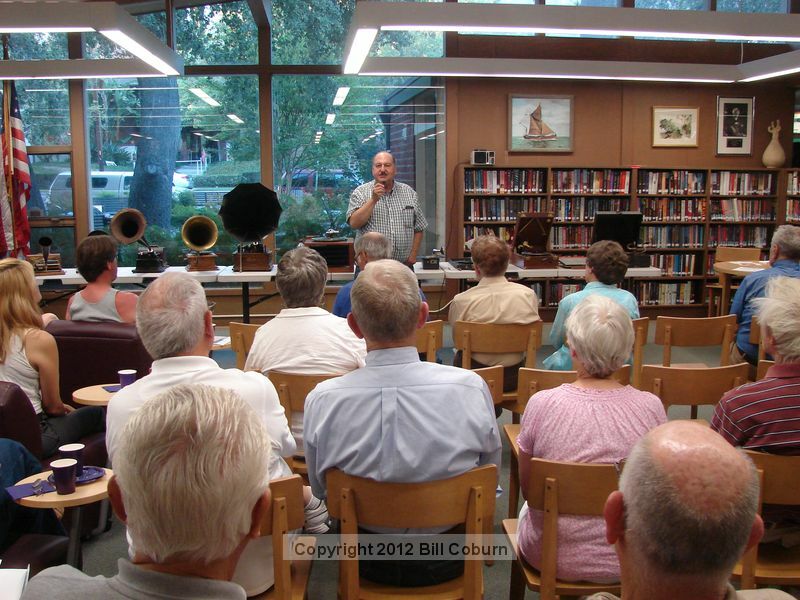 As it was the Annual Members’ meeting, those in attendance received a packet of information about the Society, which included an application for membership, a synopsis of the Society’s activities and accomplishments during the 2011-2012 fiscal year, some financial information, a flyer about the two Sierra Madre museums, Lizzie’s Trail Inn and the Richardson House, a contact sheet for the Society’s Board members, and some historical postcards. 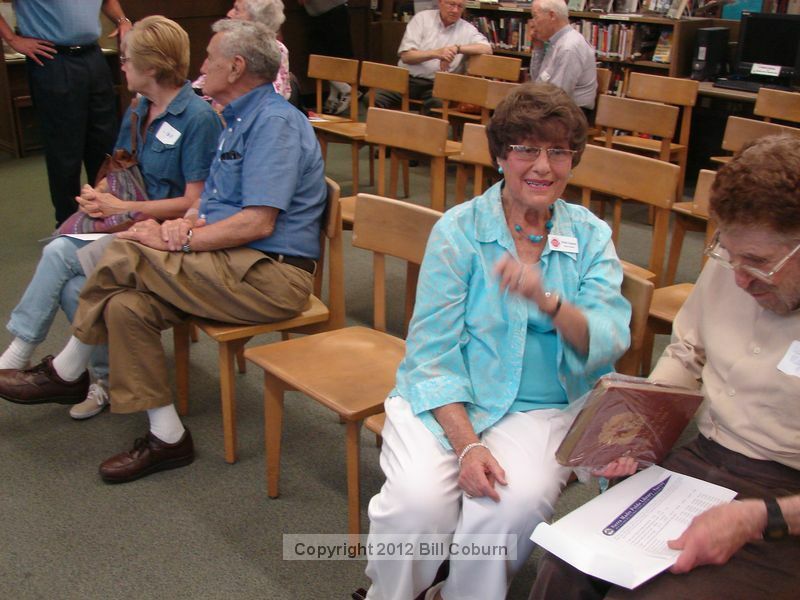 She concluded by telling everyone that “this year’s board is committed to bringing you a fun-filled, historically informative year…Stay tuned for coming attractions.” She then introduced Debbie Henderson, whose job was to introduce the evening’s speaker, Mr. Jim Constantian. box of old records near a South Pasadena city incinerator as a child. 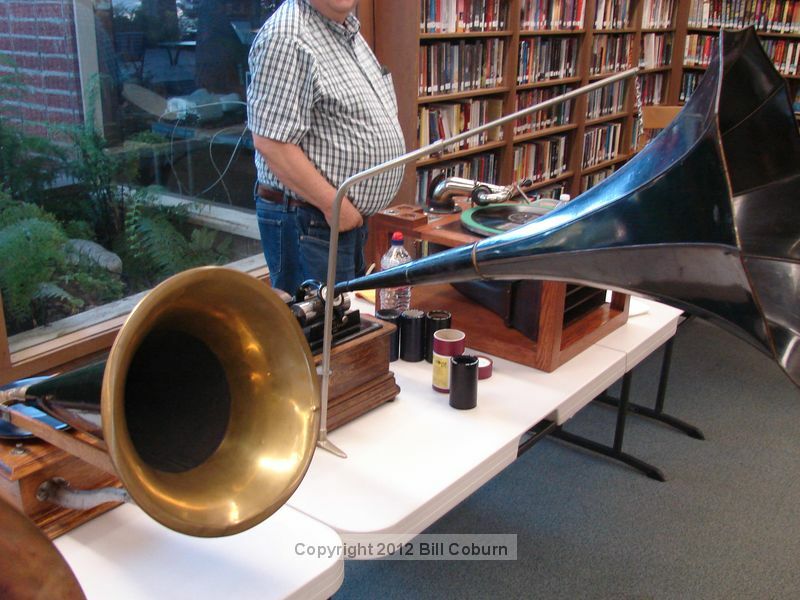 Today that collection includes hundreds of recordings and more than 100 antique phonographs, which play either discs or the old wax cylinders that pre-dated them. 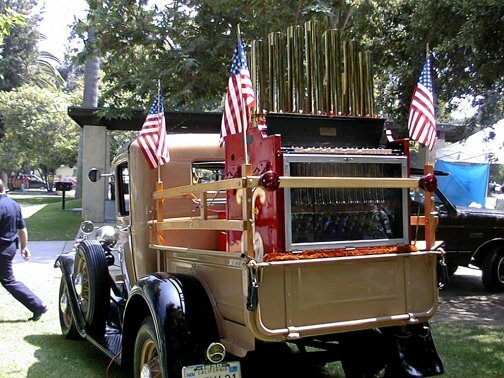 He has participated in the 4th of July parade for nearly 30 years, his Model A pick-up often outfitted with an antique calliope that he owns, playing old time music for the parade goers. 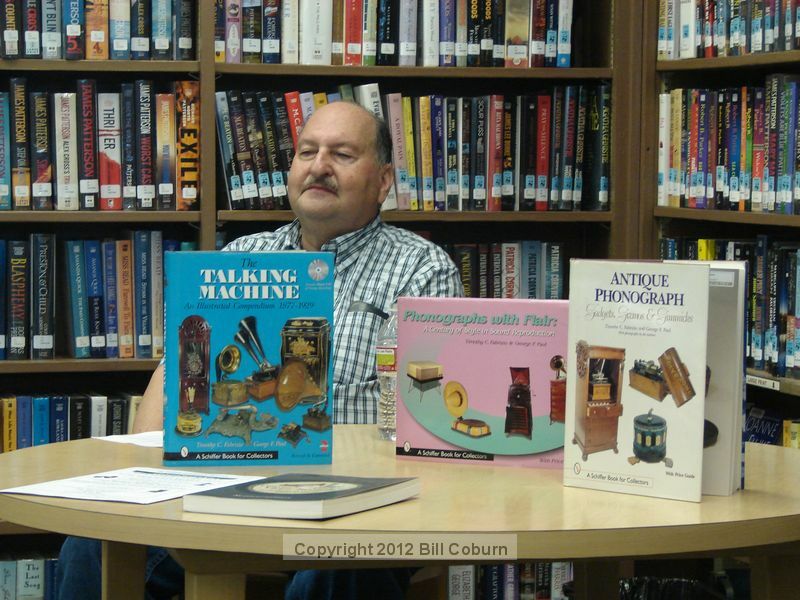 He is currently the historian for Sierra Madre Congregational Church. 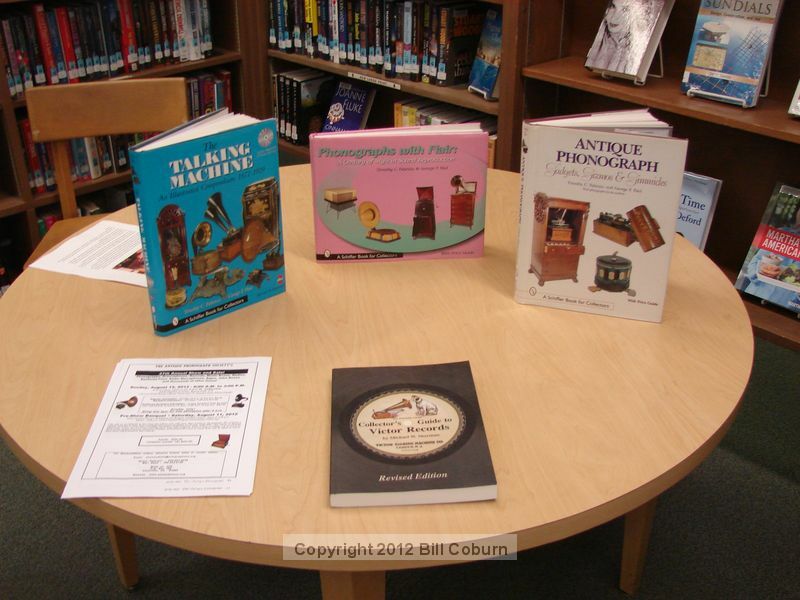 Mr. Costantian gave an informative and entertaining presentation on antique phonographs and “talking machines.” He had more than a dozen of the machines with him, dating back to the turn of the 20th century. 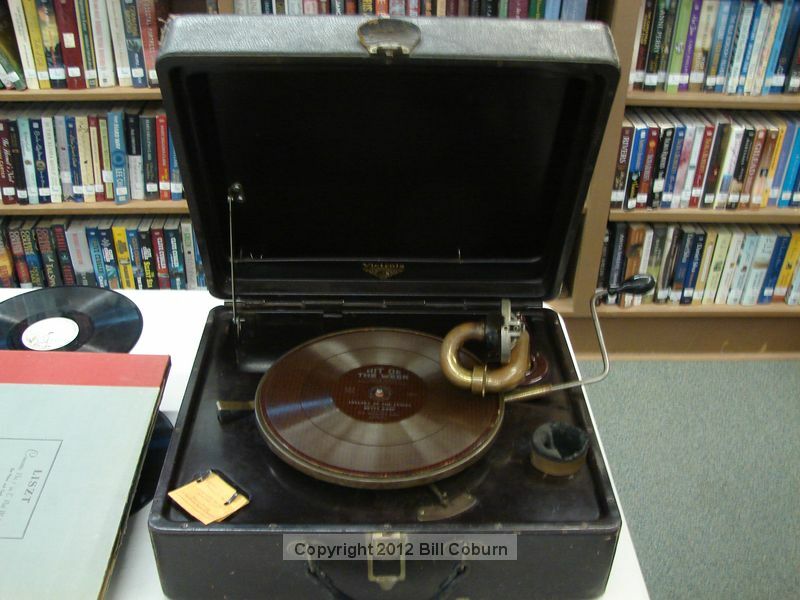 He also demonstrated them, playing discs and cylinders featuring early ragtime recordings, humorous songs, a congratulatory message to the returning WWI troops recorded by Thomas Edison (the first time Edison ever consented to allowing his voice to be recorded), and I’m told (I left about an hour into the program), recordings by Charles Lindbergh and William Jennings Bryan. 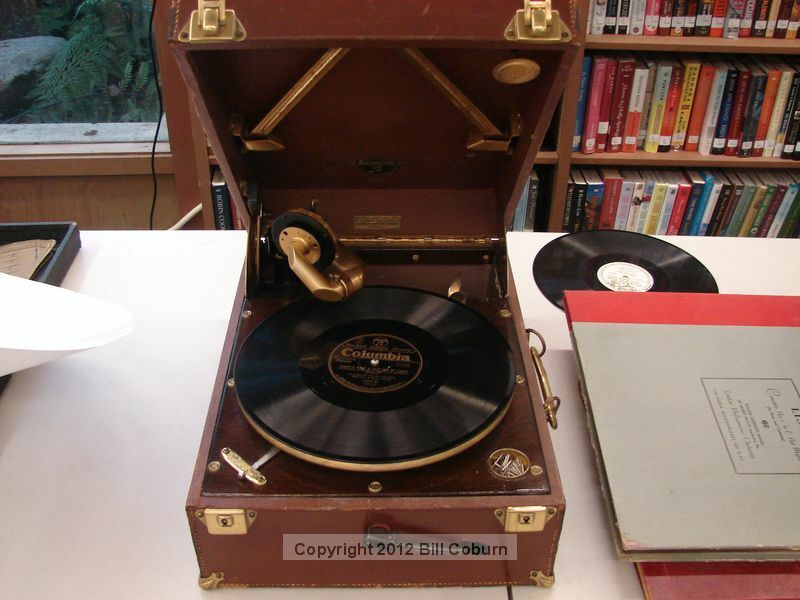 Enjoy the photo gallery below, and below that, you’ll (soon) have an opportunity to view video that will allow you to listen in on some of the early recordings mentioned above. 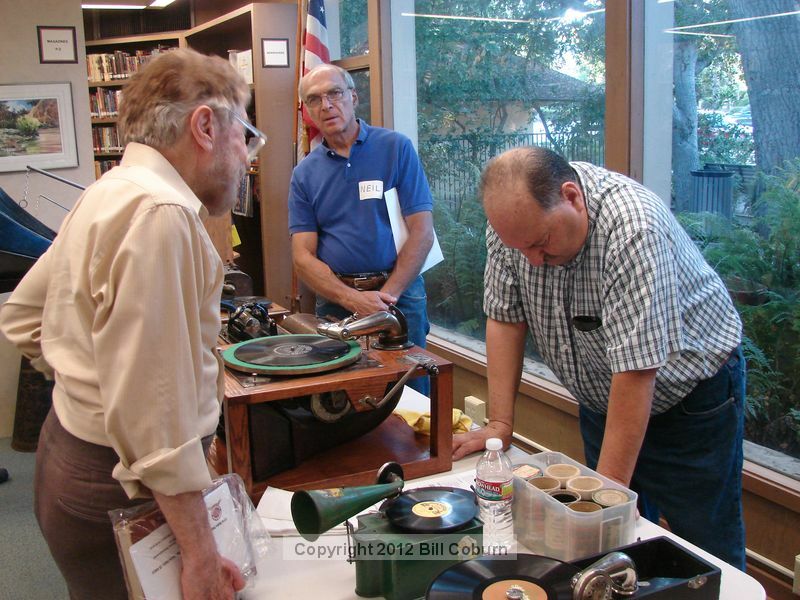 Collector Jim Costantian, right, chats with SMHPS member Albert Metzgar. 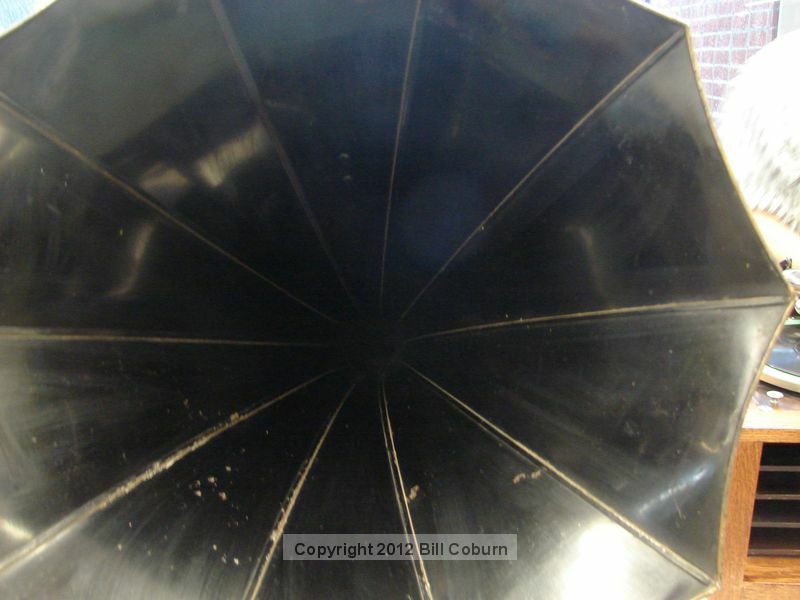 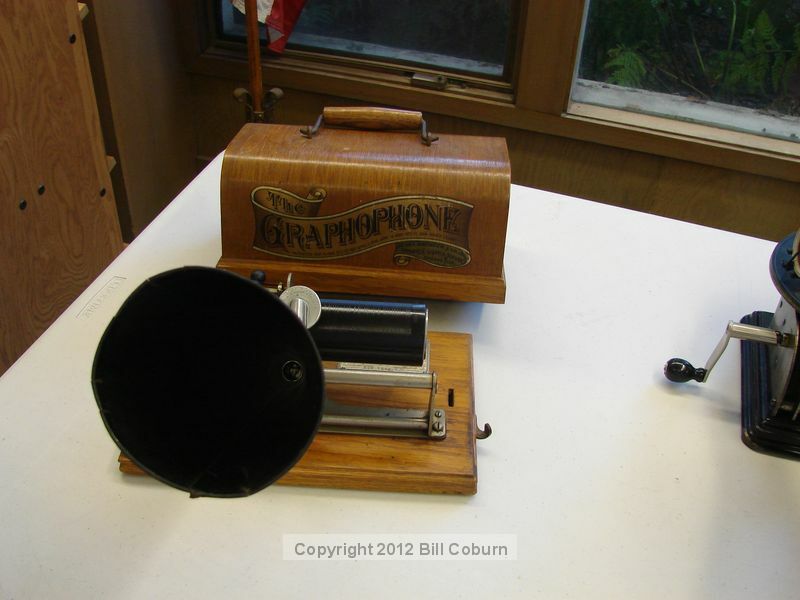 If I remember correctly, Mr. Costantian said this early 1900s phonograph cost about $7.50 new, or about $250 in today’s dollars. 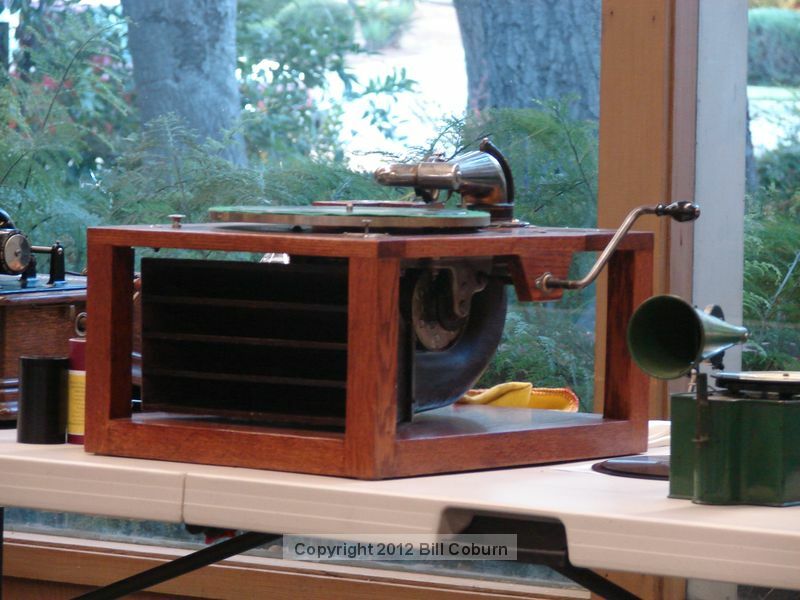 2 Comments on "Historical Preservation Society Annual Meeting, Antique Phonograph Presentation, Photos and Video"
Thanks, Bill for such nice coverage of the SMHPS’s July meeting/program. 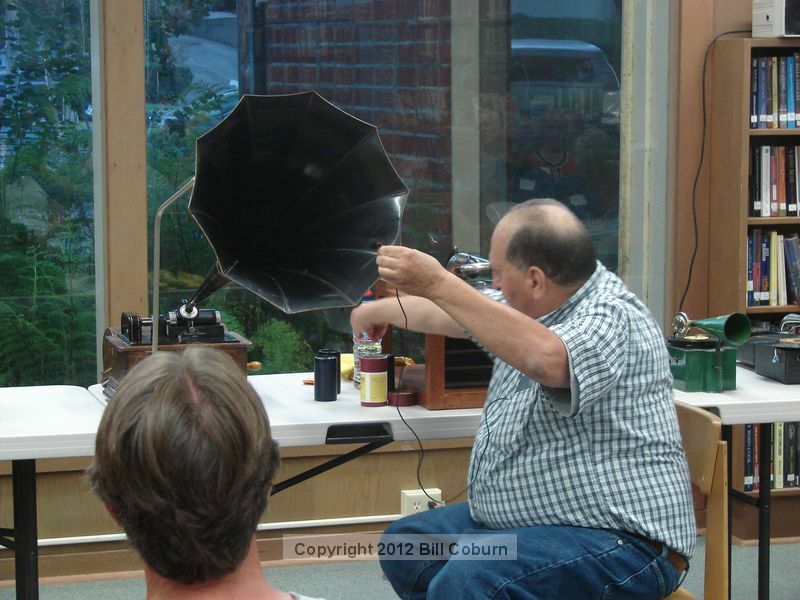 We had a lot of fun and the attendees found the program to be very interesting! 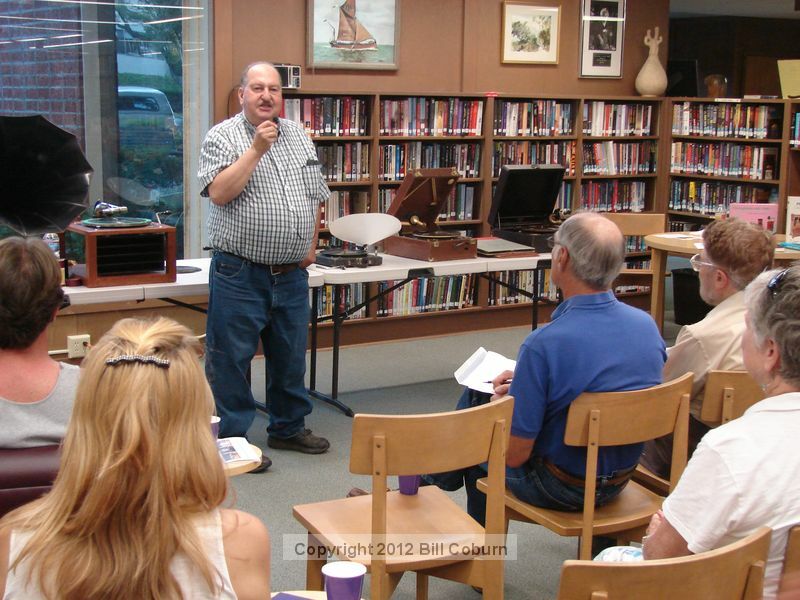 Thanks to Debbie Henderson for arranging for Jim Constantian to speak on his old phonograph collection. 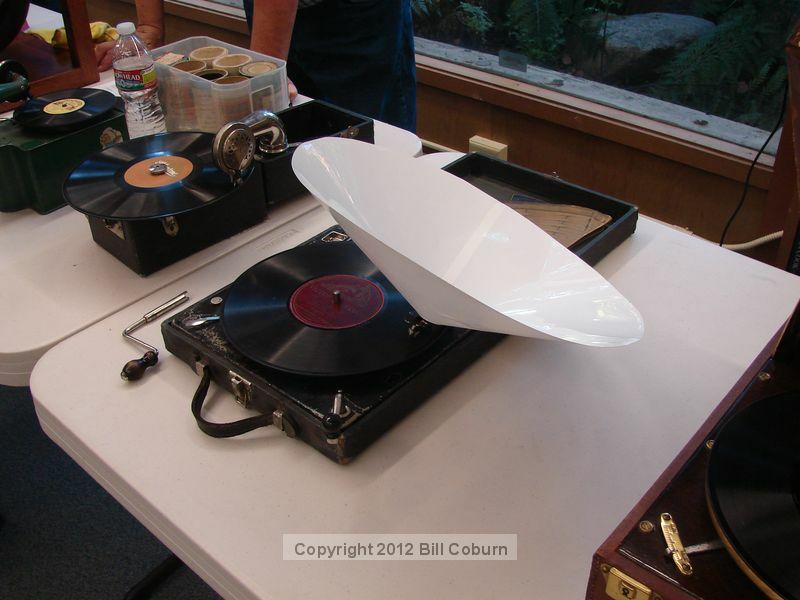 We’ll keep you in the loop regarding future programs. 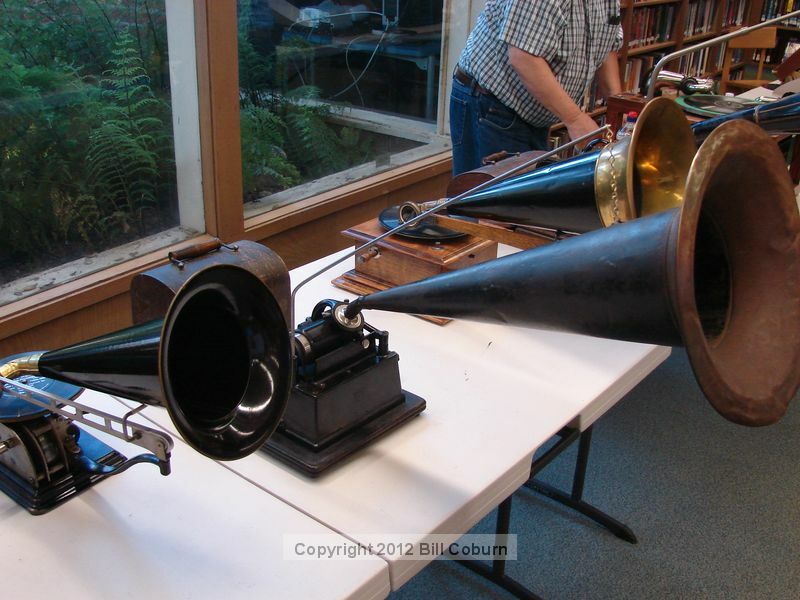 We’ll be working on the year’s schedule in August to find interesting & meaningful historical programs for the Sierra Madre Community!